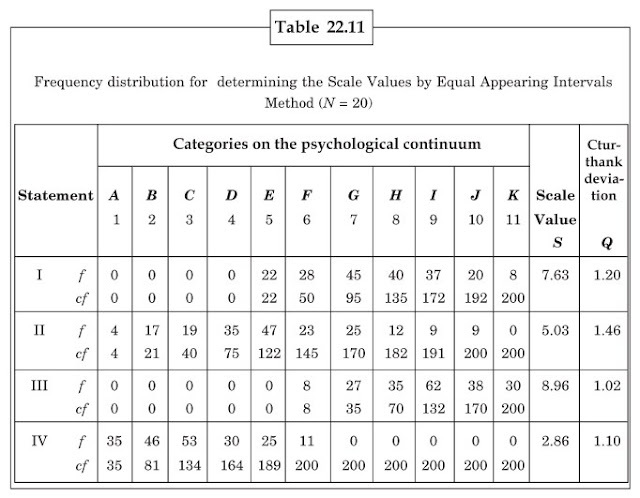 Similar to the method of paired comparisons, scale values are known in a same manner in the equal- appearing method by re-scaling the statements on psychological continuum. Therefore equal appearing method is also included in the group of scaled statements methods of Attitude scaling. To know the scale value by rescaling the statements through couple Comparative method is advantageous only when the number of rescaling statements is less. In the method of paired comparisons all the possible pairs are prepared, and people are asked for a comparative judgment on all the pairs. If the number of statements is n then every person has to give (n (n –1)/2) numbers of comparative judgments. For twenty statements, 190 , for twenty five statements, 300 , for thirty statements, 435 , for forty statements 780 , for fifty statements 1225 and for sixty statements 1770 comparative judgments are needed. It is clear that if the number of statements is more, then to present the statements in couples and to receive judgments, there is a lot of wastage of time, money and energy. Normally, the availability of people is not possible to give their judgments, on different pair of statements. Not only, it takes more time to give judgments on high number of statements, but it also takes more time to calculate and know the scale value in F matrix, P matrix and Z matrix, and also the chances for error increase. Keeping these problems of method of paired comparison, in 1929, Equal-Appearing Interval method was formulated by Thurston and Chave. Opposite to the method of paired comparison, in Equal-Appearing Interval Method, every person has to give only one decision for every statement. Due to the simplicity and easiness of Equal-Appearing Interval Method, it is broadly used to know the scale value, when the number of statements is high. 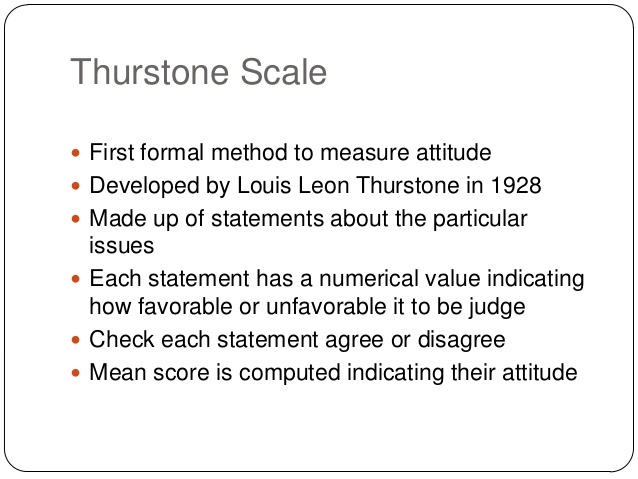 Although Equal-Appearing Interval method was described by Thurston and Chave at very first time, yet, in the history of psychological research and scaling, it is popularly known as Thurston method for measuring attitude, and the scale prepared through this method is called Thurston scale. In Equal Appearing Interval Method, for statements related to some person, thing or process, efforts are made with the help of experts to divide the statements on the basis of limit of attitude expression, in 11 categories. These 11 categories are located almost at the same intervals on psychological continuum. This psychological continuum is shown in Figure 22.5. It is clear that he statements expressing maximum adverse attitude will be placed in category A, and the statements expressing maximum favorable attitude, will be placed in category K, neutral and unresponsive statements will be placed in category F. As the categories move forward from F, to K, the expressed quantity of favorable attitude in statements increase, and when the categories move backwards from F to A direction, the expressed quantity of unfavorable attitude in statements increases. Thurston and Chave used Cards for dividing the statements in 11 categories. Every statement was written on a separate card, and the experts/judges were asked to arrange these cards from A to K, in 11 groups on the basis of quantity of attitude expressed by the statements. This is to be very clearly understood that experts/judges have not to express the quantity of their own Attitude, but they have to categorize the cards according to the limits of attitudes reflected through statement. The investigators, scale manufactures, and psychologists have used different methods from time to time in the past to know the judgments of experts/ judges. Some used printed statements and gave 11 columns in front of it, and the judges/experts have to give their opinion by ticking a right sign on one of them. Some have presented either eleven alphabets from A to K or number from 1-11 in front of the statements, and experts/judges have to give their judgment by marking a circle on one of them. Some have presented a eleven inches long straight line which represents psychological continuum from favorable to unfavorable, and experts/judges have to give their judgment by ticking a sign of right on an appropriate place. The judgment on the statements is known by Experts/Judges, through these different methods or any other method and the statements are categorized in eleven parts subsequently. Although Thurston and Chave tried three hundred judges for these types of judgments, but later on this was experienced that reliable scale value can also be achieved even with a less number of experts. These days scale values are known normally on the basis of judgment of thirty to fifty experts. Thurston and Chave believed that a same interval is found in the quantity of attitude expressed by the attitude statements divided in eleven piles and the statements of these piles are given marks from one to eleven. It is clear that cards of A pile will be marked 1, cards of B pile will be marked 2, cards of C pile will be marked 3... and cards up to K piles will be marked up to eleven. In other words on the psychological continuum on which the experts have divided the statements in eleven piles, there are eleven Scale determination points. Thus both the ends of eleven point prescription scale express the favorable attitude and unfavorable attitude. The average value can be obtained for every statement, on the basis of marks given by the experts on the statements, which will be a scale value of a statement on the eleven point psychological continuum. Thurston and Chave used the median as an average value. Therefore, in this way the scale value of a statement will be the median of points given on eleven point scale, by experts/judges. To method to know the scale value of a statement through Equal Appearing Interval Method, will be clarified with an example given ahead, but a very important question should be considered before it. Some judges/experts may be careless or negligent due to their disliking while dividing the statements in 11 categories on psychological continuum. Besides sometimes they also make mistake in understanding the instructions, and sometimes experts arrange the statements according to their own agreement or disagreements instead of the statement’s limit of expressing the attitude. In this situation it will be compulsory to separate the incorrect judgments at the time of obtaining scale values. Thurston and Chave gave 130 statements to the experts, to categorize in eleven categories and they rejected the judgments of those who had selected 30 or more than 30 statements in a category, by saying their judgments were given unconsciously. In this way they did not included the judgments of 41 experts out of 341 experts for knowing scale values of the statements. Therefore, the judgments of those experts who put more than 25% statements in a category can be rejected on the basis that the experts have not done their work carefully and their judgments should not be included in the process of obtaining scale values of the statements. In Equal-Appearing Interval Method Scale normally more statements are prepared, in the beginning and the appropriate statements which are selected on the basis of judgments given by experts are included and the final form of attitude scale is prepared by them. The medians and fourth deviation Q is calculated by these judgments given by the experts. 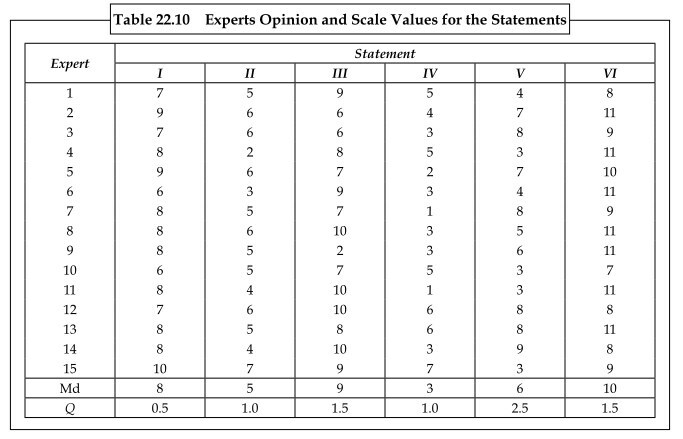 Median indicates scale value of different statements while fourth Deviation Q tells about the difference between judgments of experts. It is clear that the statements should be considered more clear and appropriate in which the deviation is less or we can say experts are more agreed on them. When the uniformity is more on judgments then the deviation Q is less. The excess value of Deviation Q denotes more difference of opinion in the judgment of different experts which is certainly ambiguous. Thurston and Chave accepted that the fourth deviation Q denoted that statement is ambiguous. Due to the different explanations on a particular statement by judges, the experts give different judgments about the expressed attitude statement, and as a result the value of Q increases. Therefore, only those statements should be included in the last draft of the attitude on which the experts have uniformity on their scale values means the deviation Q is less. Normally very less number of statements is included in the final form of attitude scale prepared by Equal-Appearing Interval Method. Normally a final form of Attitude Scale is prepared from 20 to 25 statements. 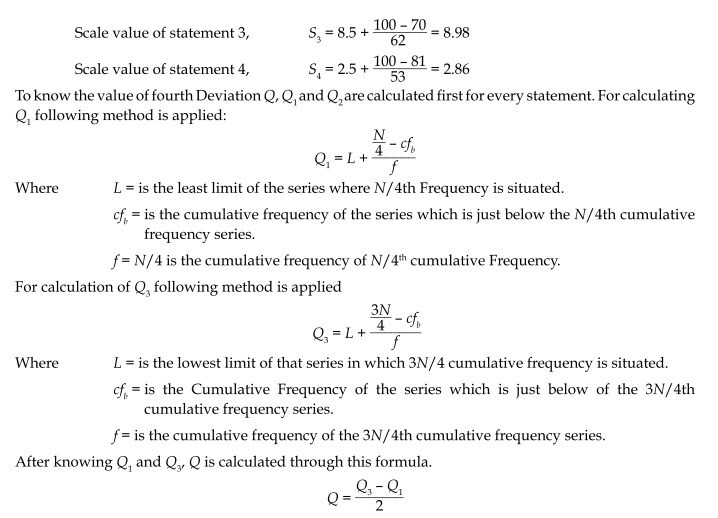 While selecting the statements, the scale value S and fourth deviation Q is considered. The statements are selected in this way that the scale values S are distributed at relatively equally space on the psychological continuums, and the fourth deviation value, Q, is comparatively less. If we have to select only one statement among the statements with equal values then statement who has less fourth deviation is selected , because that is considered least ambiguous. After selecting a few statements out of many statements on the basis of scale Value and deviation, the selected statements are arranged in a random order and are presented to those people whose attitude is to be scaled. People have to express their agreements and disagreements with those statements. The person who shows his agreement with the statements, the attitude score is known with the help of scale value of those statements, which presents the position of attitude of that person on the psychological continuum. To know the attitude score, the median is calculated. In other words the person who agrees with the statements, the median of scale value of the statements will be the attitude score. For instance, if a person shows his agreement with five statements, the scale value of those ﬁ ve is subsequently: 4.6, 7.5, 6.3, 5.2 and 3.7, then by using median method the attitude score will be 5.2. By using Median his attitude score will be the median of these five scales i.e., 5.46. After preparing the last draft of the scale, its reliability and legality is known. It has become like a tradition in Equal -Appearing Interval Method that two parallel drafts of attitude scale should be prepared and by representing them on a big scale, their parallel draft reliability should be calculated. Any other appropriate method can also be used to know the legality and norms. For the convenience of the readers the method for calculating median, scale value and fourth deviation on the basis of judgments of experts about Attitude statements, is demonstrated with the help of an example. For example, six statements are prepared to know the attitude scale in the beginning, which were given to fifteen experts with an instruction that they arrange them in an order of favorableness and unfavorablness on the 11 points on Psychological Continuum to express the attitude. 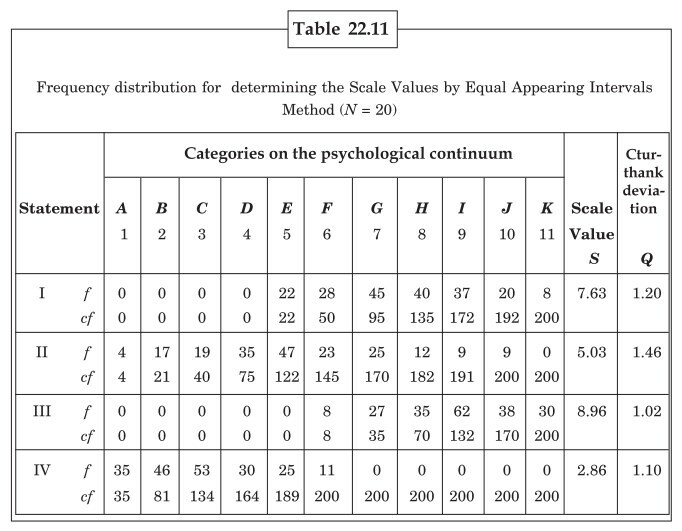 The judgments given by experts are presented in Table 22.10 and for the convenience to know the median and fourth deviation, the judgments of experts are denoted in 1, 2, 3……9, 10, 11 instead of A, B, C…J, K and the value of median and deviation Q will automatically be clarified by the numerical study. Normally, the number of experts /judges is high (50 or above) to know the scale value of the statement in Equal Appearing Interval Method. For this reason it is difficult and uneasy to know the value of median and fourth deviation by preparing the table. In this situation the judgments given by experts on a statement are arranged in different frequencies and with the help of frequency distribution, the medians and fourth deviations are known. An example for this type of frequency distribution is given in Table 22.11. For above mentioned four statements, the values of Q , subsequently 1.20, 1.46, 1.02 and 1.10 are obtained. In this way, scale values S and Q are known for all the statements. For statements, the values of S and Q can also be known with the help of graph and monographs. The scale value of different statements expresses psychological continuum. Scale values and fourth deviation of mentioned statements of Table 22.11 are shown in Figure 22.6. After knowing the Scale Value and calculating the value of Q, a final dorm of scale is prepared by selecting some statements, considering both the values in mind. After that the reliability and legality of Scale is obtained. Normally, preparing and composing 50 or more than 50 attitude statements. Arranging the attitude statements in a sequence from unfavorable to favorable on the eleven-point psychological continuum by experts. Converting the judgments given by experts in numbers, and calculating the median and fourth deviation for every statement. The medians of received scores given by the experts will be called scale value of statement. By considering median and fourth deviation, scale values should be selected in such a way for attitude scale that the scale values of selected statements should be distributed on the entire Continuum in an equal interval and the fourth deviation should be less as possible. Preparing the final draft of the attitude scale by arranging the selected statements in a random order. Applying the attitude scale on those people whose attitude is to be scaled, and to indicate favorable and unfavorable views on the statements from them. Obtaining the medians or mean values of scale values of the person who have agreed on the statements. That mean value or median will be the score value of the attitude of that person. To know the reliability and legality of the attitude scale and evaluate their norms.